Charlie Hall runs regular Thursday breakfasts in Mile End, and has now started to branch out into brunches in London Bridge. The 2pm sitting is completely sold out, so don't miss the earlier 11am one. "This Sunday I am running my second popup brunch event at The Rooftop Cafe, London Bridge. 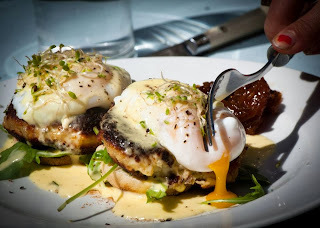 The idea being to offer creative takes on classic brunch dishes all provided with a laid back, Sunday vibe. We do a 3 course brunch with breakfast inspired canapes and glass of prosecco on arrival for £30. The Rooftop have an awesome drinks list to accompany.